in 2006 we decided to widen our interests and develop a small herd of breeding Alpacas. This has been a very interesting and enjoyable experience. 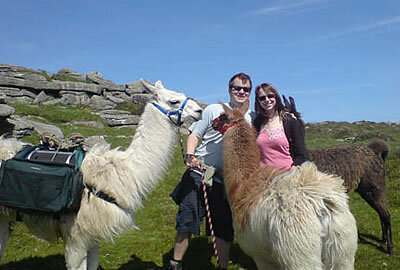 We have now reduced our Breeding Herd to concentrate on our Llama & Alpaca walks. We now only have a few female alpacas as Pets. They graze in the field next to Robin Cottage. We always welcome guests to help out with feeding in the mornings. Guests in Robin Cottage are welcome to visit the Alpacas during their stay. 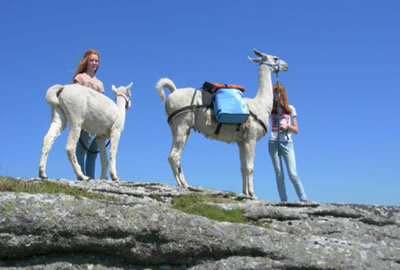 In 2007 we started Dartmoor Llama Walks. 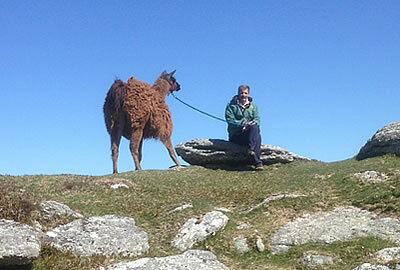 We are offer a range of guided Dartmoor walks, We currently have 5 Llamas and 4 Alpacas in our Trekking Team. 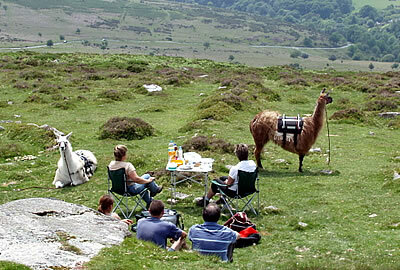 The Llamas carry the picnic and we stop in a scenic location for a relaxing picnic.This is a unique way to explore Dartmoor and relax with a Llama or Alpaca. Our Trekking Team live very close by and Guests are welcome to visit them during their stay. Our walks include a picnic using locally produced or sourced fresh produce, from homemade soup and locally baked bread in the colder months to a Cream Tea or fresh strawberries and clotted cream on our summer walks. 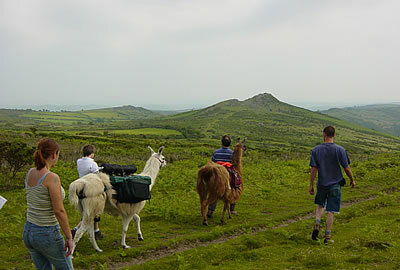 Dartmoor llama walks offer a range of walks suitable for all abilities and varying in length. We operate all year round as long as the weather allows. We can tailor our walks to meet your requirements. All walks must be booked in advance. Prices are per person and a minimum of two people must be booked per walk. Individually tailored walks can be organised at other times by prior arrangement. Start by meeting our Llamas followed by a short introduction about the animals and instruction on how to handle them on the walk. We then start our walk over moorland and country lanes stopping for a lunch break and rest for the llamas. We include a homemade picnic using local produce, hot or cold drinks. Continuing our walk we return to either the start point or a pre arranged finish point. The start time is earlier in winter months and could start late morning with a light lunch instead of cream tea. A shorter walk lasting 2 1/2 – 3 hrs following the same format as the Half Day walk. Stopping to enjoy a traditional Cream Tea of homemade scones, Jam and Devonshire Clotted Cream with a choice of Tea, Coffee or soft drinks. Start Time: To be arranged when booking. Starting with a short introduction we then set off for a relaxing evening walk, if weather and time permit we can stop at a vantage point enjoy some light refreshments are included in the price. Walks can be tailored to your needs and abilities and are happy to discuss your individual requirements. We can meet you at a car park or bus stop. Our start and finish times can be flexible to suit your itinerary with prior notice. We often take our Llamas and Alpacas to Village fairs, Farmers Markets and Organic festivals we have even taken them to Hospitals. Weddings, Our Llamas & Alpacas have been to Weddings and have Collars and ties so they can look very smart for the occasion. If you would like to have an unusual addition to your fundraising event please contact us to discuss rates etc.